International Mother Language Day was declared by UNESCO's General Conference in the year of November 1999. The day has been observed on every year since the year of February, 2000 to promote linguistic, cultural diversity and multilingualism. It is observed worldwide on February 21. It is observed to celebrates language diversity and variety worldwide. It also remembers events such as the killing of four students on February 21, 1952, because they campaigned to officially use their mother language, Bengali, in Bangladesh. The partition of India in 1947, the Bengal province was divided according to the predominant religions of the inhabitants. The western part became part of India and the eastern part became a province of Pakistan known as East Bengal and later East Pakistan. However, there was economic, cultural and lingual friction between East and West Pakistan. On 21 March 1948, Mohammed Ali Jinnah, the Governor general of Pakistan, declared that Urdu would be the only official language for both West and East Pakistan. The people of East Pakistan (now Bangladesh), whose main language is Bengali, started to protest against this. The government outlawed the protests but on February 21, 1952, students at the University of Dhaka and other activists organized a protest. Later that day, the police opened fire at the demonstrators and killed four students. These students' deaths in fighting for the right to use their mother language are now remembered on International Mother Language Day.. In Bangladesh, February 21 is the anniversary of a pivotal day in the country's history. People lay flowers at a Shaheed Minar (martyr's monument). They also purchase glass bangles for themselves or female relatives, eat a festive meal, organize parties, award prizes or host literary competitions. It is a time to celebrate Bangladesh's culture and the Bengali language.The Linguapax Institute, in Barcelona, Spain, aims to preserve and promote linguistic diversity globally. The institute presents the Linguapax Prize on International Mother Language Day each year. The prize is for those who have made outstanding work in linguistic diversity or multilingual education. "Mother tongue instruction and inclusive education"
Find out below some practical suggestions from UNESCO. Do pupils know that many children in their schools may have mother language(s) that are different from the languages used in their schools? Teachers can get these children to introduce themselves and talk about their families and their cultures, and teach a little of their mother language to other children. They can read poetry, tell a story or sing a song in their mother language. Paintings and drawings with captions in mother languages can be displayed inside and outside schools. They may know that their fellow students come from a different culture and use a different language but they don't take the time to find out more. This is the opportunity to do so. They can make a survey on mother languages existing on the campus by interviewing fellow students and publish the results on internet. Cultural activities such as films, plays and music that celebrate different languages can be organized. Every year UNESCO produces press information about the Day. 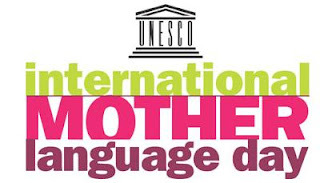 let us popularize Feb 21 as the International Mother Language Day. മലയാളം എന്റെ മാതൃഭാഷയാണ്, ഞാന്‍ അതില്‍ അഭിമാനിക്കുന്നു. Its remember a proverb which i study at my schools days. Now a days peoples are going very fast to some where. Even they don't know where we are going :) because of the situation. All are day by day losing their originality due to fit modern culture. How many peoples know about the history of their mother language? history about home town? very few only.